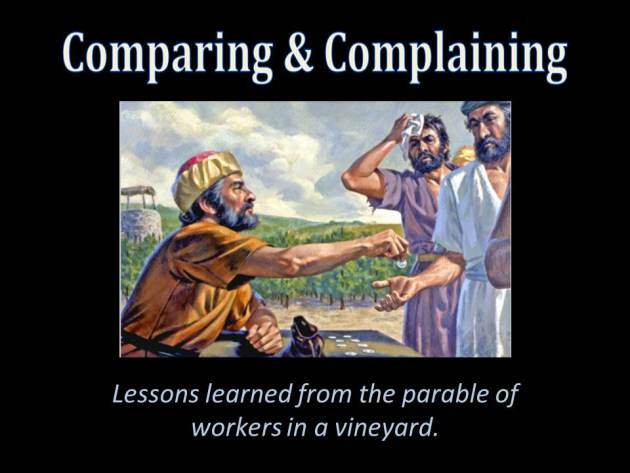 This chapter tells the parable of the vineyard workers – or, as the SAB calls it, the parable of the unfair, lying employer. I guess it’s supposed to illustrate the point made in v 16. And I disagree that the employer lied. What he did was legal, if unfair. But what message does it really send – take what you get and shut up. This seems to be a frequent tenet of religion – and not just Christianity. Would you want to work for this employer? This parable, along with all the other kid-friendly parables and stories from the NT, are available as short, soft-cover children’s Sunday school books. These are the same ones I had back in the 1960’s; I can’t believe they’re still around. At v 20, there is a repeat of the request from 2 disciples to sit next to Jesus in heaven (see Mark 10), except that this time, it’s their mother who asks on their behalf. Doesn’t matter, the answer is still no. Jesus says that he has no right to say who will sit where – his ‘Father’ makes that decision. This answer doesn’t make much sense in view of the doctrine of the Trinity – since supposedly Jesus and the ‘Father’ are one and the same. The other disciples question the selection process, and Jesus makes the same point as in the vineyard parable – whoever wants to be first will just end up being last. In other words, don’t ask any favors; take what you get and shut up about it. What else is new? The end of the chapter is a rerun of the blind beggar story, except that this time there are two blind men. In v 34, Matthew deems it necessary to add that Jesus showed compassion; this is missing in Mark’s account (10:52). Jesus is gradually becoming kinder and more refined. This chapter gets back to Jesus’ triumphant entry into Jerusalem. Whereas Mark wasn’t sure whether he rode a donkey or a colt (ch 11), Matthew solves the problem by including both. Matthew also adds the bit about this ride fulfilling prophesy in Zechariah 9:9. I’m thinking that it intentionally fulfills this prophesy. (And it’s hokum.) In v 9-10 the people are cheering ‘hosanna’ and the entire city is in an ‘uproar’. It was recently pointed out to me that ‘hosanna’ means ‘save us’. In that case, if this scene had really happened as described, it would have been viewed by the governing Romans as an act of sedition by the Jews, and dealt with severely. Yet there is no mention of it in historical documents outside the bible. Matthew has Jesus clearing the temple before cursing the fig tree; the opposite of Mark 11. Note the OT references for v 13 (Isaiah 56:7 and Jeremiah 7:11) (similar to Mark’s version). But Matthew adds the bits about Jesus healing and performing ‘wonderful miracles’ while he was there, and the additional OT reference in v 16 to Psalm 8:2. All this proves to me is that Jesus (or, more to the point, “Matthew”) knows the scriptures well and that he is determined to link to as many as possible. In v 28 Jesus tells the parable of two sons, unique to Matthew. It’s easy to interpret – walk the walk, don’t just talk the talk; or, actions speak louder than words. Not a hard concept, no superstition required to understand that. And lastly we get a repeat of the tenant farmers who murdered the landowner. I discussed this back in Mark 12, and the story is unchanged in Matthew except for the addition of v 43-44 – presumably to make sure everyone gets the (nasty) point of it.